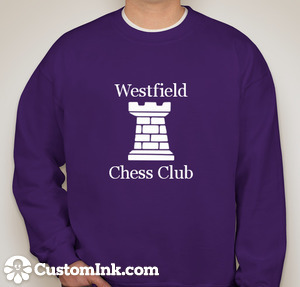 The Westfield Chess Club has organized a group order of sweatshirts & t-shirts from Custom Ink. If you want to order one or both please visit the above links, login, select your size & pay for your item with PayPal or a credit card. A 35 cent processing fee will be added to each purchase. We will also be taking orders at our November 12th, November 19th & November 26th tournaments. Cash (preferred) or check: $20 for the sweatshirt, $15 for the tee. Prices will be lower if the group orders more than 10 of an item. The deadline for orders is midnight on November 30. Those who ordered items will receive them at our December 17th Holiday Blitz, Party & Quads. 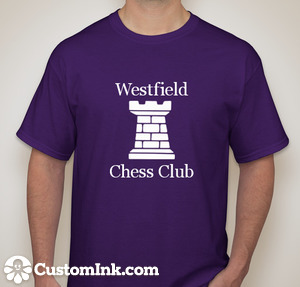 In case you didn't know... the Westfield Chess Club has a Facebook group. Visit https://www.facebook.com/groups/206766012999002/ & request to join.